Released early in 1983, the Apple IIe was a natural refinement of that first Apple built way back in 1976 by the young firm of Jobs and Wozniak. 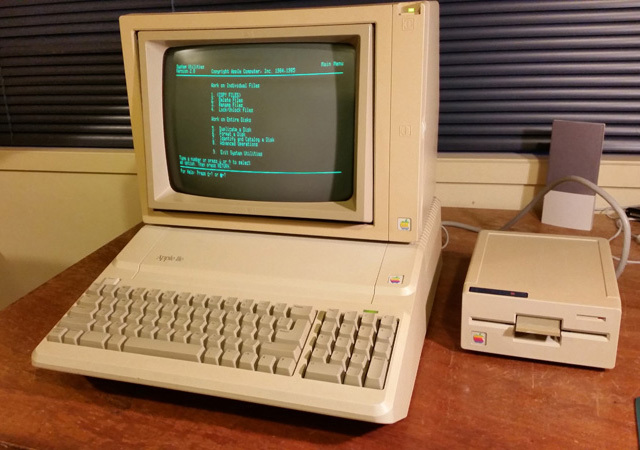 Unlike many micros released in 1983, which were pitching their services at the home OR business, the Apple IIe followed the style of its earlier siblings and was a general purpose machine. However Apple was never into the cost slashing that characterised Commodore at the time. The Apple IIe wasn't cheap! In New Zealand the price was such that it was all but excluded from the home market. Despite being near the high-end of the micro market, the Apple IIe was popular all over the world. Such was the legacy of its predecessors those who embraced this computer became avid, if not quasi-religious fans! This despite the fact that in many ways the technology (6502 processor, 64K RAM but no dedicated sound or graphics chips) was somewhat outmoded even as it first appeared. The Apple line embraced open architecture though (an idea also adopted by IBM with their microcomputer) and this lead to huge third-party support. With an extra card, the Apple IIe could even do CP/M and Wordstar with the best of them. A targeted campaign to the education market, loyal fan base and truckloads of peripherals and software ensured quiet but continuing success even compared to his flashier cousin the Macintosh. I've got three Apple IIes; standard, enhanced and platinum models ranging from excellent to very good condition along with the genuine Apple color and mono monitors. 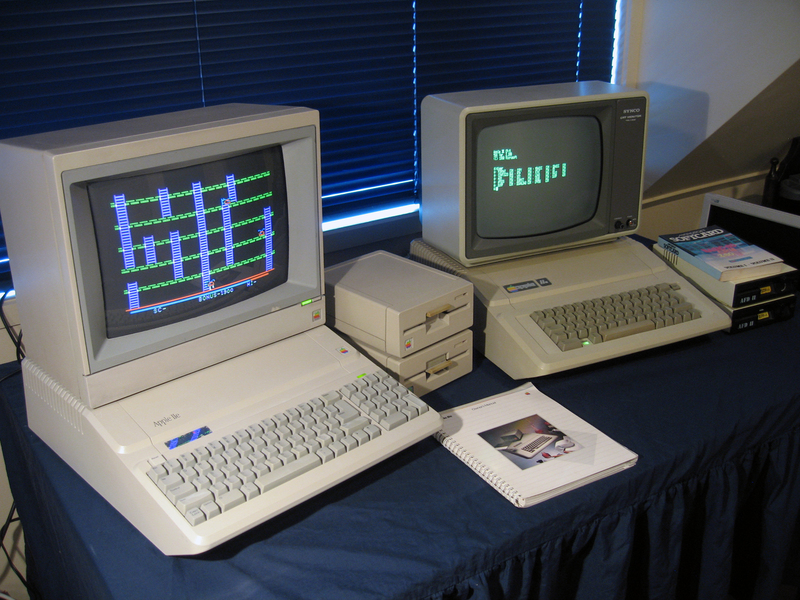 The machine on the left in the photo is an Apple IIe Platinum. It was in poor shape when I first got it requiring deyellowing and a few IC replacements. I've since sold that one in the picture replacing it with pristine equivalent I found in a school rescue. The CP/M configured Apple IIe (enhanced) on the right needed little attention. The only problem I had with it was a non-responsive "1" key, which has since been fixed. I've got plenty of software for these units via the web and disk image transfer tools, and a stack of original manuals. I have to say I was underwhelmed with Apple DOS 3.3 and ProDos. They were functional enough but didn't compare with the features found in my good old NEWDOS 80 v. 2.0 for the TRS-80 Model 1/System 80. Given "Applemania" and the fact they were a big fan of the traditional computer hobbyist, I'd expected more. However, that doesn't make me regret having a few Apple IIes. No collection is complete without at least one example of this classic machine.